Unsure what to wear to your first Steampunk Party? 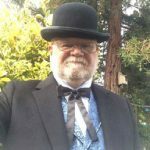 Attending your first Steampunk Convention and want to fit in? Fear not, we can help you look your steamy best! The most important thing to consider is your character and their backstory. Do you want to be an Air Pirate sailing through the skies absconding with other travelers' riches? Or are you the inveterate Tinkerer looking to build the latest gadget? Or, perhaps, the Aristocratic adventurer looking for a little excitement beyond the strictures of high society? As you think of the character's backstory be sure to consider a few key characteristics for your persona, such as: gender, wealth, societal status, and future goals. Once you have a clear character in mind, crafting a Steampunk costume becomes much easier, and it will give you a good idea of the sorts of steampunk props and accessories you should consider. If you don't currently have a character in mind, please visit our Steampunk Costumes page to look at a few of our suggestions. But, if you have decided on your character, then it is time to start choosing your outfit. Steampunk fashion borrows heavily from victorian times, with the industrial revolution and the expansion of the British and American Empires serving as a sartorial backdrop. With that in mind, much of steampunk costuming is often "Victorian Plus", i.e. based on a period costume but with a fantasy or science fiction twist. Muted earth tones and jewel tones seem to exemplify the classic Steampunk look. Sturdy victorian tweed and cotton fabrics, with silk, wool and velvet for higher class citizens. Brass and leather accessories abound, as do gadgets and gizmos and the hallmarks of the age of discovery. The key is to mask or hide any modern elements (plastic, digital, bright colors,) as modern elements will "break the spell" of the costume. 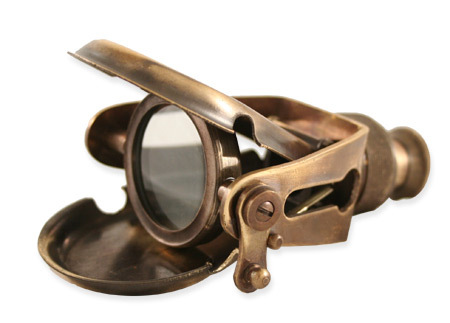 It would not be too strong a statement to say that no steampunk costume is complete without a pair of vintage looking goggles. 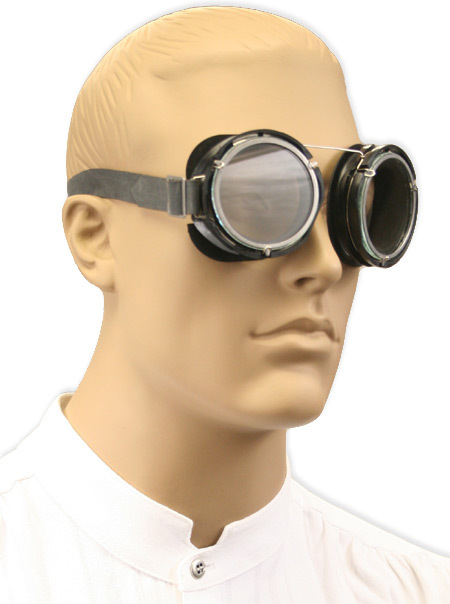 Goggles are central to many of the steampunk personas you will encounter. Whether it's an airship pilot blocking the wind, a mad scientist defending against toxic spills, or a desert explorer marching through the sand, many Steampunk character occupations require eye protection, and goggles are an essential accessory and easy to wear. Monocles and "Monoggles" are also popular, often with villianous characters but can also be heroic "Mad-Eye Moody" sorts who have seen the world and lost an eye. While socializing, goggles are often worn loosely around the neck, or stretched around hat bands. Out of the way, but kept handy in case of emergencies. Since Steampunk Personas often harken back to Victorian England, a vintage vest or waistcoat is an important costume basic. It was extremely rare to see men in public without a waistcoat during the Victorian Era. The man's shirt was considered the equivalent of an undergarment and was expected to be covered by a vest and coat. If you are a tinkerer, mad scientist, aeronaut or adventurer, consider a 4 pocket cotton or canvas vest. This will be a durable option and give plenty of pockets to collect important necessities. If you are an aristocrat or other highly placed individual, a fancier vest of silk or velvet would be more appropriate with a color and style to accent or highlight the rest of your outfit. You'll definitely need one of these. 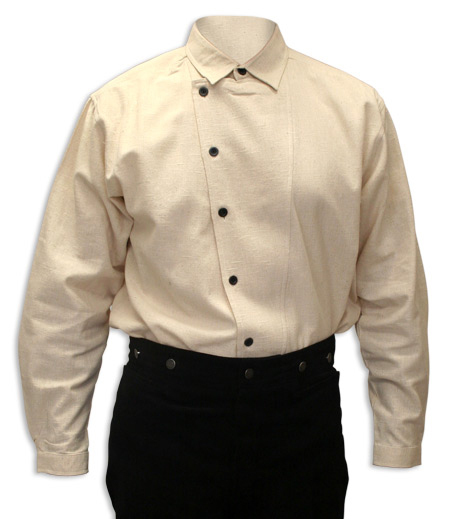 Collarless, sturdy cotton work shirts are ideal for the mechanics and inventors, while a ruffled, puffy shirt would be appropriate for the Air Pirates and Aeronauts. Finally, the high collar or wing tip dress shirts will stand out for the Victorian Gentleman or Aristocrat. 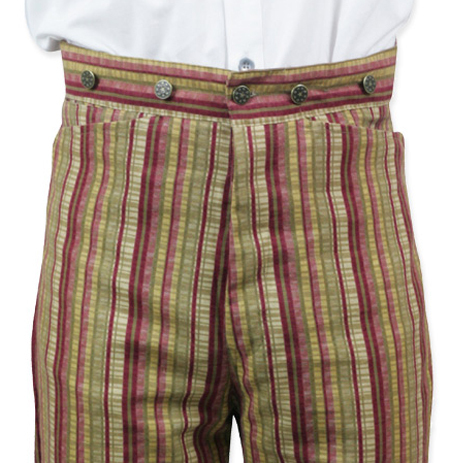 Victorian gents wore high-waisted trousers, often with plaids or stripes. 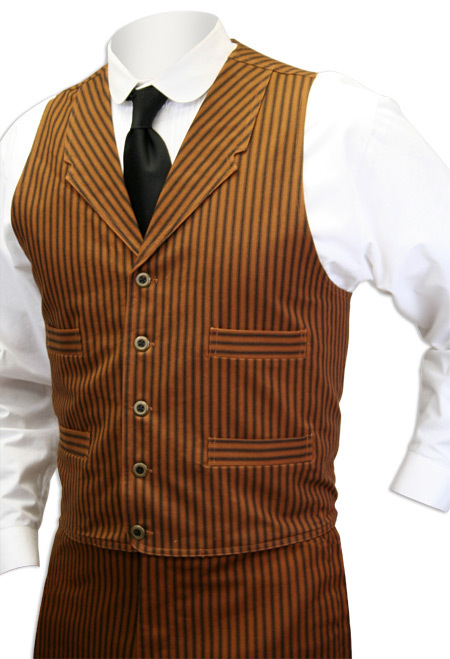 Simple black or gray, or earth tones (browns, tans) and bold stripes are a great option for steampunk trousers. Fall Front trousers are a unique statement piece for the fancy aristocrat, while a hands-on Scientist, Mechanic or Inventor would be more comfortable in a pair of our fly front canvas pants or cotton stripe trousers. Knickers can also be appropriate for certain costumes. A wide range of options are available. For the Aristocrat there are bowlers and top hats, with or without gears. 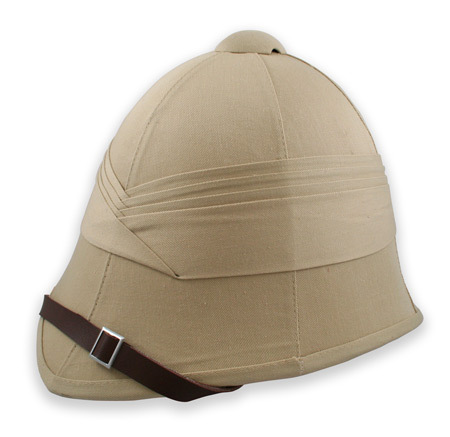 For occupational characters there are a variety of specific hats to consider: a pith helmet for the military or adventurer or a leather aviator helmet for the Aeronaut or Air Pirate. For the mechanically inclined, a pair of protective boots is always a welcome addition, preferably with laces and noticeable hardware. 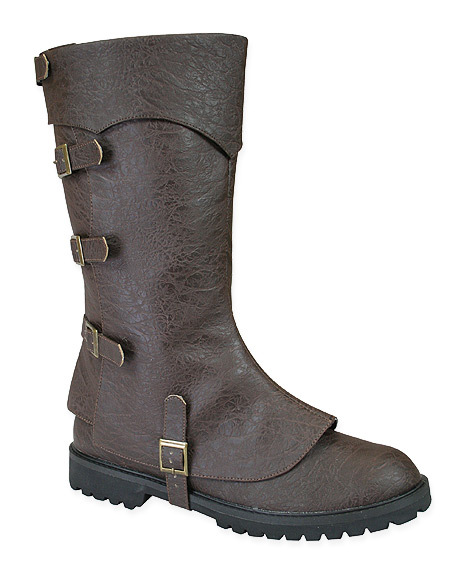 Boots can be knee or ankle length depending on your styling and your preference for comfort during your event. Leather shoes and boots can get expensive, so if you're on a budget, you can just add a pair of satin or tweed spatterdashes (spats) to modern black shoes and instantly transform them into turn-of-the-century footwear! The world is your oyster with this one! Since you have invented your character, you can choose your favorite silhouette for a coat. 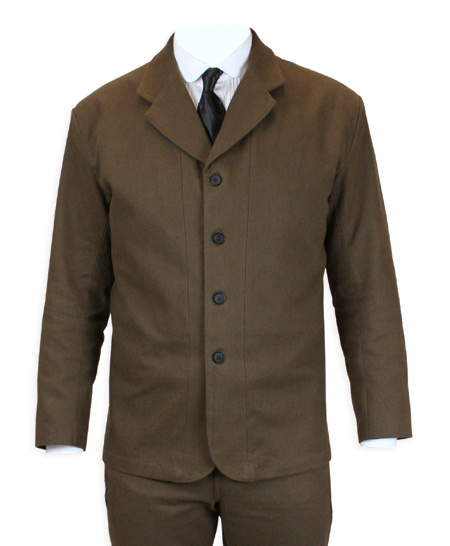 Frock coats are truly Victorian and can be interpreted in a number of ways for Steampunk Costumes. An Inverness cape or cloak is another popular option, evoking Sherlock Holmes in the London Fog. You can use a tailcoat for a formal, aristocratic look, or a howie-style lab coat for a Vintage Mad Scientist or Victorian Inventor look. Characters from less affluent backgrounds can still wear any of these items, but they would likely be worn and dingy as the coat would be a hand-me-down and damaged while living the rough and tumble Air Pirate life or playing a soot-stained Mechanic. Goggles, gauntlets and gears are a few of the accoutrement that you can consider for adding that final flourish to your creation. Mechanical pocketwatches, leather arm braces, and telescopes are all commonly seen in a well-rounded steampunk costume. Other frequently used accessory is the Utility Belt, after all everyone could use a few extra pockets. We sell all of the basics for steampunk costuming, and you can get a complete outfit in one throw. 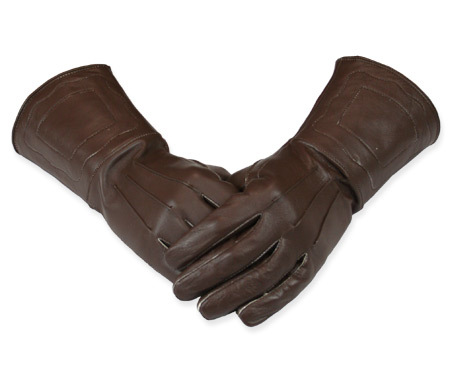 However, one of the hallmarks of steampunk fashion and cosplay is unique gadgets and gizmos and one-of-a-kind hand-made gadgets are always a great conversation starter. As you build your character and outfit, think of unique accessories that character might wear or carry to complete the look, and get crafty! A bit of creativity and a little paint turns a nerf gun into a wood and brass blunderbuss, and a quick run to a yard sale or thrift store can net you kitchen gadgets or strange decorations that look great when painted and repurposed as jewelry or unusual tools. We hope this introduction to Steampunk Costuming is helpful and inspiring. We encourage you to start with the basics and build your wardrobe over time. For more inspiration and costume ideas, visit our Steampunk Outfit page, our customer gallery of Steampunk outfits, or jump right in to our steampunk store and start building your alternate-history wardrobe now! I found your website years ago when I was looking to build a steampunk persona to go to conventions as. I was expecting cheaply made costume pieces that might look nice for a few wearings, but would ultimately fall apart. Was I ever wrong! I have been consistently impressed with the quality of apparel I've purchased from your store, and have loved being able to easily find nice looking clothes that fit my 2XL-wide keyster. I'm sorry that my budget only allows me to buy a few things a year, but every item I've bought has become a part of my daily wardrobe. Vest I ordered for an upcoming steampunk themed wedding is awesome. Great quality and unbelievable shipping time. Looking forward to wearing this my vest. 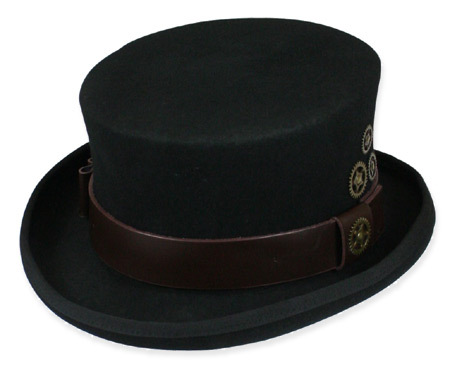 The steampunk bowler I ordered arrived in 3 days. It was packaged to ensure safety. IT is my favorite hat, but I will save it for spring and summer wear. I wore it for two days after receipt and received numerous compliments. I like it. I modified the hatband with a piece of light chain and a Celtic knot concho. I like to make my hat my own. Quick delivery and the customer service really assisted when it mattered. They ended up saving me time and money, and I was prepared for a steampunk event at the end of the week. Plus a quality product at a decent value. Thanks again folks.